James Longstreet (January 8, 1821 – January 2, 1904) was one of the foremost Confederate generals of the American Civil War, the principal subordinate to General Robert E. Lee, who called him his "Old War Horse." He served under Lee as a corps commander for many of the famous battles fought by the Army of Northern Virginia in the Eastern Theater, but also with Gen. Braxton Bragg in the Army of Tennessee in the Western Theater. Longstreet's talents as a general made significant contributions to the Confederate victories at Bull Run, Fredericksburg, and Chickamauga, in both offensive and defensive roles. He also performed strongly during the Seven Days Battles, the Battle of Antietam, and until he was seriously wounded, at the Battle of the Wilderness. His performance in semiautonomous command at Knoxville, Tennessee, resulted in an embarrassing Confederate defeat. His most controversial service was at the Battle of Gettysburg, where he disagreed with General Lee on the tactics to be employed, and reluctantly supervised the disastrous infantry assault known as Pickett's Charge. He had a successful post-war career working for the U.S. Government as a diplomat, civil servant, and administrator. However, his conversion to the Republican Party and his cooperation with his old friend, President Ulysses S. Grant, as well as critical comments he wrote in his memoirs about General Lee's wartime performance, made him anathema to many of his former Confederate colleagues. Authors of the Lost Cause movement focused on Longstreet's actions at Gettysburg as a primary reason for the Confederacy's loss of the war. Longstreet was born in Edgefield District, South Carolina. James's father decided on a military career for his son, but felt that the local education available to him would not be adequate preparation. At the age of nine, James was sent to live with his aunt and uncle in Augusta, Georgia. His uncle, Augustus Baldwin Longstreet, was a newspaper editor, educator, and a Methodist minister. James spent eight years on his uncle's plantation, Westover, just outside the city, while he attended the Richmond County Academy. His father died from a cholera epidemic while visiting Augusta in 1833; although James's mother and the rest of the family moved to Somerville, Alabama, following his father's death, James remained with uncle Augustus. In 1837, Augustus attempted to obtain an appointment for James to the United States Military Academy, but the vacancy for his congressional district had already been filled, so James was appointed in 1838 by a relative, Reuben Chapman, who represented the First District of Alabama, where Mary Longstreet lived. James was a poor student academically and a disciplinary problem at West Point, ranking 54th out of 56 cadets when he graduated in 1842. He was popular with his classmates, however, and befriended a number of men who would become prominent during the Civil War, including George Henry Thomas, William S. Rosecrans, John Pope, D.H. Hill, Lafayette McLaws, George Pickett, John Bell "Sam" Hood, and his closest friend, Ulysses S. Grant of the class of 1843. Longstreet was commissioned a brevet second lieutenant in the 4th U.S. Infantry. Longstreet served with distinction in the Mexican War with the 8th U.S. Infantry. He received brevet promotions to captain for Contreras and Churubusco and to major for Molino del Rey. In the Battle of Chapultepec on September 12, 1847, he was wounded in the thigh while charging up the hill with his regimental colors; falling, he handed the flag to his friend, Lt. George E. Pickett, who was able to reach the summit. After the election of Abraham Lincoln, Longstreet decided that his allegiance belonged to the South. He was not enthusiastic about secession from the Union, but he had learned from his uncle Augustus about the doctrine of states' rights early in his life and had seen his uncle's passion for it. Although he was born in South Carolina and raised in Georgia, he offered his services to the state of Alabama, which had appointed him to West Point, and where his mother still lived. Furthermore, he was the senior West Point graduate from that state, which implied a commensurate rank in the state's forces would be available. He resigned from the U.S. Army in June 1861 to cast his lot with the Confederacy in the Civil War. Longstreet arrived in Richmond, Virginia, with a commission as a lieutenant colonel in the Confederate States Army. He met with Confederate President Jefferson Davis at the executive mansion on June 22, 1861, where he was informed that he had been appointed a brigadier general with date of rank on June 17, a commission he accepted on June 25. He was ordered to report to Brig. Gen. P.G.T. Beauregard at Manassas, where he was given command of a brigade of three Virginia regiments—the 1st, 11th, and 17th Virginia. Tragedy struck the Longstreet family in January 1862. A scarlet fever epidemic in Richmond claimed the lives of his one-year-old daughter Mary Anne, his four-year-old son James, and six-year-old Augustus ("Gus"). His 13-year-old son Garland almost succumbed. The losses were devastating for Longstreet and he became withdrawn, both personally and socially. In 1861, his headquarters was noted for parties, drinking, and poker games. After he returned from the funeral, the headquarters social life became more somber; he rarely drank, and he became a devout Episcopalian. Longstreet turned in a mixed performance in the Peninsula Campaign that spring. He executed well as a rear guard commander at Yorktown and Williamsburg, delaying the advance of Union Major General George B. McClellan's army toward Richmond. At the Battle of Seven Pines, he marched his men in the wrong direction down the wrong road, causing congestion and confusion with other Confederate units, diluting the effect of the massive Confederate counterattack against McClellan. His report unfairly blamed fellow general Benjamin Huger for the mishaps. General Joseph E. Johnston was wounded during the battle and he was replaced in command of the Army of Northern Virginia by General Robert E. Lee. The military reputations of Lee's corps commanders are often characterized as Stonewall Jackson representing the audacious, offensive component of Lee's army, whereas Longstreet more typically advocated and executed defensive strategies and tactics. In the Northern Virginia Campaign of August 1862, this stereotype did not hold true. Longstreet commanded the Right Wing (later to become known as the First Corps) and Jackson commanded the Left Wing. Jackson started the campaign under Lee's orders with a sweeping flanking maneuver that placed his corps into the rear of Union Major Gen. John Pope's Army of Virginia, but he then took up a defensive position and effectively allowed Pope to assault him. On August 28 and August 29, the start of the Second Battle of Bull Run, Pope pounded Jackson as Longstreet and the remainder of the army marched north to reach the battlefield. When Longstreet's men arrived around midday on August 29, Lee ordered a flanking attack on the Union Army, which was concentrating its attention on Jackson. Longstreet delayed for the rest of the afternoon, requesting time for personal reconnaissance, and forcing a frustrated Lee to issue his order three times. By 6:30 P.M., the division of Brigadier General John Bell Hood moved forward against the troops of the Union V Corps, but Longstreet withdrew them at 8:30 P.M. Longstreet was criticized for his performance and the postbellum advocates of the Lost Cause claimed that his slowness, reluctance to attack, and disobedience to General Lee were a harbinger of his controversial performance to come on July 2, 1863, at the Battle of Gettysburg. 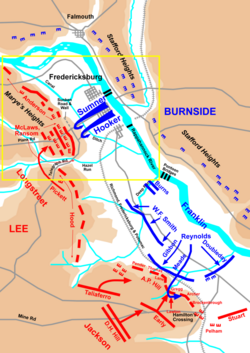 Battle map of the action at Fredericksburg in December, 1862. Despite this criticism, the following day, August 30, was one of Longstreet's finest performances of the war. Pope came to believe that Jackson was starting to retreat and Longstreet took advantage of this by launching a massive assault on the Union army's left flank with over 25,000 men. Longstreet and Lee were together during the assault and both of them came under Union artillery fire. Although the Union troops put up a furious defense, Pope's army was forced to retreat in a manner similar to the embarrassing Union defeat at First Bull Run, fought on roughly the same battleground. Longstreet gave all of the credit for the victory to Lee, describing the campaign as "clever and brilliant." It established a strategic model he believed to be ideal—the use of defensive tactics within a strategic offensive. Longstreet's reputation as a defensive general was cemented by his performance in the final two major battles of 1862. In the Maryland Campaign of September, at the Battle of Antietam, Longstreet held his part of the Confederate defensive line against Union forces twice as numerous. At the end of that bloodiest day of the Civil War, Lee greeted his subordinate by saying, "Ah! Here is Longstreet; here's my old war-horse!" On October 9, a few weeks after Antietam, Longstreet was promoted to lieutenant general. Lee arranged for Longstreet's promotion to be dated one day earlier than Jackson's, making the Old War-Horse the senior lieutenant general in the Confederate Army. In an army reorganization in November, Longstreet's command, now designated the First Corps, consisted of five divisions, approximately 41,000 men. In December, Longstreet's First Corps played the decisive role in the Battle of Fredericksburg. There, Longstreet positioned his men behind a stone wall on Marye's Heights and held off 14 assaults by Union forces. About 10,000 Union soldiers fell; Longstreet lost only 500. His great defensive success was not based entirely on the advantage of terrain, however. Remembering the slaughter at Antietam that had been magnified by a lack of defensive works, Longstreet ordered trenches, abatis, and fieldworks to be constructed, which would set a precedent for future defensive battles of the Army of Northern Virginia. Following the Battle of Chacellorsville and the death of Stonewall Jackson, Longstreet and Lee met in mid-May to discuss options for the army's summer campaign. Longstreet advocated, once again, detachment of all or part of his corps to be sent to Tennessee. The justification for this course of action was becoming more urgent as Union Major General Ulysses S. Grant was advancing on the critical Confederate stronghold on the Mississippi River, Vicksburg. Longstreet argued that a reinforced army under Braxton Bragg could defeat Rosecrans and drive toward the Ohio River, which would compel Grant to break his hold on Vicksburg. Lee was opposed to a division of his army, however, and instead advocated a large-scale offensive or raid into Pennsylvania. The Army of Northern Virginia was reorganized after Jackson's death. Two division commanders, Richard S. Ewell and A.P. Hill, were promoted to lieutenant general and assumed command of the Second and Third Corps, respectively. Longstreet's First Corps gave up the division of Major General Richard H. Anderson during the reorganization, leaving him with the divisions of Lafayette McLaws, George Pickett, and John Hood. In the initial movements of the campaign, Longstreet's corps followed Ewell's through the Shenandoah Valley. A spy he had hired, Harrison, was instrumental in warning the Confederates that the Union Army of the Potomac was advancing north to meet them more quickly than they had anticipated, prompting Lee to order the immediate concentration of his army near Gettysburg, Pennsylvania. Longstreet's actions at the Battle of Gettysburg would be the centerpiece of the controversy that surrounded him for over a century. He arrived on the battlefield late in the afternoon of the first day, July 1, 1863. By then, two Union corps had been driven by Ewell and Hill back through the town into defensive positions on Cemetery Hill. Lee had not intended to fight before his army was fully concentrated, but chance and questionable decisions by A.P. Hill brought on the battle, which was an impressive Confederate victory on the first day. Meeting with Lee, Longstreet was concerned about the strength of the Union defensive position and advocated a strategic movement around the left flank of the enemy, to "secure good ground between him and his capital," which would presumably compel the Union commander, Maj. Gen. George G. Meade, to attack defensive positions erected by the Confederates. Instead, Lee exclaimed, "If the enemy is there tomorrow, we must attack him." 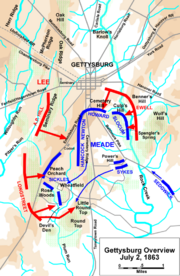 Lee's plan for July 2 called for Longstreet to attack the Union's left flank, which would be followed up by Hill's attack on Cemetery Ridge near the center, while Ewell demonstrated on the Union right. Longstreet got off to a slow start, waiting for some of his brigades to arrive and forced to take a long detour while approaching the enemy position. During the artillery barrage that preceded the infantry assault, Longstreet attempted to pass the responsibility for launching Pickett's division to his artillery chief, Lt. Col. Edward Porter Alexander. And when the time came to actually order Pickett forward, Longstreet could only nod in assent, not verbalize the order. 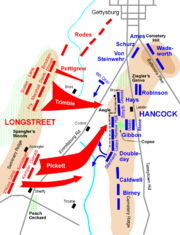 The assault, known as Pickett's Charge, suffered the heavy casualties that Longstreet anticipated. It was the decisive point in the Confederate loss at Gettysburg and Lee ordered a retreat back to Virginia the following day. In mid-August 1863, Longstreet resumed his attempts to be transferred to the Western Theater. He wrote a private letter to Secretary of War James Seddon, requesting that he be transferred to serve under his old friend General Joseph E. Johnston. He followed this up in conversations with his congressional ally, Senator Louis Wigfall, who had long considered Longstreet a suitable replacement for Braxton Bragg. Since Bragg's army was under increasing pressure from Rosecrans outside of Chattanooga, Lee and President Davis agreed to the request. In one of the most daunting logistical efforts of the Confederacy, Longstreet, with the divisions of Lafayette McLaws and John Hood, a brigade from George Pickett's division, and Porter Alexander's 26-gun artillery battalion, traveled over 16 railroads on a 775 mile route through the Carolinas to reach Bragg in northern Georgia. Although the entire operation would take over three weeks, Longstreet and lead elements of his corps arrived on September 17. Longstreet soon clashed with the much maligned Bragg and became leader of a group of senior commanders of the army who conspired to have him removed. Bragg's subordinates had long been dissatisfied with his leadership and abrasive personality; the arrival of Longstreet, the senior lieutenant general in the army, proved to be a catalyst toward action. 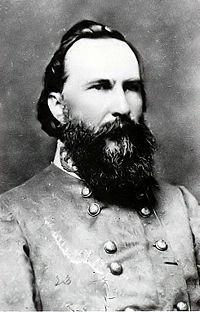 Bragg retained his position and retaliated against Longstreet by reducing his command to only those units that he brought with him from Virginia. After participating in some minor battles that preceded the Battle of Chattanooga, Longstreet and his men were dispatched to East Tennessee to deal with an advance by Union Major General Ambrose Burnside. Longstreet was selected for this assignment partially due to enmity on Bragg's part, but also because the War Department intended for Longstreet's men to return to Lee's army and this movement was in the correct direction. Longstreet was criticized for the slow pace of his advance toward Knoxville in November and some of his troops began using the nickname Slow Peter. Burnside evaded him at the Battle of Campbell's Station and settled into entrenchments around the city, which Longstreet besieged unsuccessfully. The Battle of Fort Sanders failed to bring a Confederate breakthrough. When Bragg was defeated by Grant at Chattanooga on November 25, Longstreet was ordered to join forces with the Army of Tennessee in northern Georgia. He demurred and began to move back to Virginia, soon pursued by Major General William T. Sherman in early December. The armies went into winter quarters and the First Corps rejoined the Army of Northern Virginia in the spring. The only real effect of the minor campaign was to deprive Bragg of troops he sorely needed in Chattanooga. Longstreet's second independent command was a failure and his self-confidence was damaged. He relieved Lafayette McLaws from command and requested the court martial of Brigadier Generals Jerome B. Robertson and Evander M. Law. He also submitted a letter of resignation to Adjutant General Samuel Cooper on December 30, 1863, but his request to be relieved was denied. Battle of the Wilderness, May 6, 1864. Finding out that his old friend Ulysses S. Grant was in command of the Union Army, he told his fellow officers that "he will fight us every day and every hour until the end of the war." Longstreet helped save the Confederate Army from defeat in his first battle back with Lee's army, the Battle of the Wilderness in May 1864, where he launched a powerful flanking attack along the Orange Plank Road against the Union II Corps and nearly drove it from the field. Once again, he developed innovative tactics to deal with difficult terrain, ordering the advance of six brigades by heavy skirmish lines, which allowed his man to deliver a continuous fire into the enemy, while proving to be elusive targets themselves. Wilderness historian Edward Steere attributed much of the success of the Army to "the display of tactical genius by Longstreet which more than redressed his disparity in numerical strength." Longstreet was wounded during the assault—accidentally shot by his own men not a mile away from the place where Jackson suffered the same fate a year earlier. A bullet passed through his shoulder, severing nerves, and tearing a gash in his throat. The momentum of the attack subsided without Longstreet's active leadership and General Lee delayed further movement until units could be realigned. This gave adequate time for the Union defenders to reorganize and the subsequent attack was a failure. E.P. Alexander called the removal of Longstreet the critical juncture of the battle: "I have always believed that, but for Longstreet's fall, the panic which was fairly underway in Hancock's II Corps would have been extended & have resulted in Grant's being forced to retreat back across the Rapidan." Longstreet missed the rest of the 1864 spring and summer campaign, where Lee sorely missed his skill in handling the army. He was treated in Lynchburg, Virginia, and recuperated in his native Georgia. He rejoined Lee in October 1864, with his right arm paralyzed and in a sling, initially unable to ride a horse. For the remainder of the Siege of Petersburg, he commanded the defenses in front of the capital of Richmond, including all forces north of the James River and Pickett's Division at Bermuda Hundred. He retreated with Lee in the Appomattox Campaign, commanding both the First and Third Corps, following the death of A.P. Hill on April 2. As Lee considered surrender, Longstreet advised him of his belief that Grant would treat them fairly, but as Lee rode toward Appomattox Court House on April 9, 1865, Longstreet said, "General, if he does not give us good terms, come back and let us fight it out." After the war, Longstreet and his family settled in New Orleans, a location popular with a number of former Confederate generals. He entered into a cotton brokerage partnership there and also became the president of the newly created Great Southern and Western Fire, Marine and Accident Insurance Company. He actively sought the presidency of the Mobile and Ohio Railroad, but was unsuccessful, and also failed in an attempt to get investors for a proposed railroad from New Orleans to Monterrey, Mexico. (In 1870, he was named president of the newly organized New Orleans and Northeastern Railroad.) He applied for a pardon from President Andrew Johnson, endorsed by his old friend Ulysses S. Grant. Johnson refused, however, telling Longstreet in a meeting: "There are three persons of the South who can never receive amnesty: Mr. Davis, General Lee, and yourself. You have given the Union cause too much trouble." The United States Congress restored his rights of citizenship in June 1868. Longstreet was the only senior Confederate officer to become a scalawag and join the Republican party during Reconstruction. He endorsed Grant for president in 1868, attended his inauguration ceremonies and, six days later, received an appointment as surveyor of customs in New Orleans. For these acts, he lost favor with many Southerners. His old friend Harvey Hill wrote to a newspaper: "Our scalawag is the local leper of the community." Unlike a Northern carpetbagger, Hill wrote, Longstreet "is a native, which is so much the worse." The Republican governor of Louisiana appointed Longstreet the adjutant general of the state militia and by 1872 he became a major general in command of all militia and state police forces within New Orleans. During riots in 1874, protesting election irregularities, Longstreet rode to meet protesters, but was pulled from his horse, shot by a spent bullet, and taken prisoner. Federal troops were required to restore order. Longstreet's use of African-American troops during the disturbances increased the denunciations by fellow Southerners. 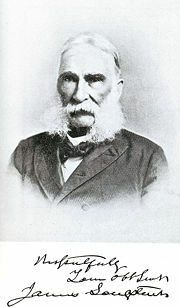 James Longstreet in later life, affecting the sideburns of his opponent at Fredericksburg and Knoxville. In 1875, the Longstreet family left New Orleans with concerns over health and safety, returning to Gainesville, Georgia. By this time, his wife, Louise had given birth to ten children, five of whom lived to adulthood. He applied for various jobs through the Rutherford B. Hayes administration and was briefly considered for Secretary of the Navy. He served briefly as deputy collector of internal revenue and as postmaster of Gainesville. In 1880 President Hayes appointed Longstreet as his ambassador to the Ottoman Empire, and later, he served from 1897 to 1904, under Presidents William McKinley and Theodore Roosevelt, as U.S. Commissioner of Railroads. On one of his frequent return trips to New Orleans on business, Longstreet converted to Catholicism in 1877 and was a devout believer until his death. He served as a U.S. marshal from 1881 to 1884, but the return of a Democrat administration ended his political careers and he went into semi-retirement on a farm near Gainesville, where he raised turkeys and planted orchards and vineyards on terraced ground that his neighbors referred to jokingly as "Gettysburg." A devastating fire in April 1889 destroyed his house and many of his personal possessions. That December, Louise Longstreet died. He remarried in 1897, in a ceremony at the governor's mansion in Atlanta, to Helen Dortch, age 34. Although Longstreet's children reacted poorly to the marriage, Helen became a devoted wife. She outlived him by 58 years, dying in 1962. 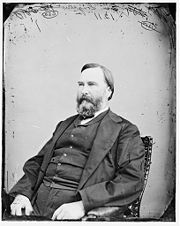 After Louise's death, and after bearing criticism of his war record from other Confederates for decades, Longstreet refuted most of their arguments in his memoirs entitled From Manassas to Appomattox, a labor of five years that was published in 1896. He outlived most of his detractors, and died of pneumonia in Gainesville, where he is buried in Alta Vista Cemetery. He was one of only a few general officers from the Civil War to live into the twentieth century. Because of criticism from authors in the Lost Cause movement, Longstreet's war career was disparaged for many years after his death. It formally began on January 19, 1872, the anniversary of Robert E. Lee's birth, and less than two years after Lee's death. Jubal Early, in a speech at Washington College, exonerated Lee of mistakes at Gettysburg and accused Longstreet of attacking late on the second day and of being responsible for the debacle on the third. The following year, William N. Pendleton, Lee's artillery chief, claimed in the same venue that Longstreet disobeyed an explicit order to attack at sunrise on July 2. Longstreet failed to challenge these assertions publicly until 1875, and the delay proved damaging to his reputation. In the twentieth century, Douglas Southall Freeman's biography of Lee and his three-volume work, Lee's Lieutenants, kept criticism of Longstreet foremost in Civil War scholarship. Clifford Dowdey, a Virginia newspaperman and novelist, was noted for his severe criticism of Longstreet in the 1950s and 1960s. Alexander, Edward Porter and Gallagher, Gary W. Fighting for the Confederacy: The Personal Recollections of General Edward Porter Alexander. University of North Carolina Press, 1989, ISBN 0807847224. Coddington, Edwin B. The Gettysburg Campaign; a study in command. Scribner's, 1968, ISBN 0684845695. Dickson, Charles Ellis. Encyclopedia of the American Civil War: A Political, Social, and Military History. Heidler, David S., and Heidler, Jeanne T., eds., W. W. Norton & Company, 2000, ISBN 039304758X. Eicher, John H., and David J. Eicher. Civil War High Commands. Stanford University Press, 2001, ISBN 0804736413. Freeman, Douglas S. Lee's Lieutenants: A Study in Command. (3 volumes), Scribners, 1946, ISBN 0684859793. Gallagher, Gary. Lee and His Generals in War and Memory. Louisiana State University Press, 1998, ISBN 0807129585. Hartwig, D. Scott. A Killer Angels Companion. Thomas Publications, 1996. ISBN 0939631954. Piston, William G. Lee's Tarnished Lieutenant: James Longstreet and His Place in Southern History. University of Georgia Press, 1990. ISBN 0820309079. Rhea, Gordon C. The Battle of the Wilderness May 5–6, 1864. Louisiana State University Press, 1994, ISBN 0807118737. This page was last modified on 18 March 2018, at 20:50.